Eleanor Glanville was the first English female lepidopterist. She has a butterfly named after her, the Glanville Fritillary, which was initially known as the Lincolnshire Fritillary as that was where she first captured it in the 1690’s. We recently filmed a few short sequences from the life of Lady Eleanor Glanville (c.1654–1709). Eleanor’s story has just been made into a novel by Fiona Mountain, Lady of the Butterflies. The shoot was for a book trailer and also formed part of an actor showreel for Tiffany Haynes. It was devised and directed by Nic Loven. We filmed at a number of Lincolnshire locations including Gainsborough Old Hall, the Lincolnshire Fens, the beautiful little church of Goltho (now sadly a burnt-out shell after a lightening strike) and did some butterfly catching with a clap net in some Lincolnshire Limewoods. Four changes of clothing were required and when I have some time I will write up about them, for now enjoy the video above. One of the things I had to make for this scene was a 17th century butterfly ‘clap net’, but with only fragmentary information to go on. 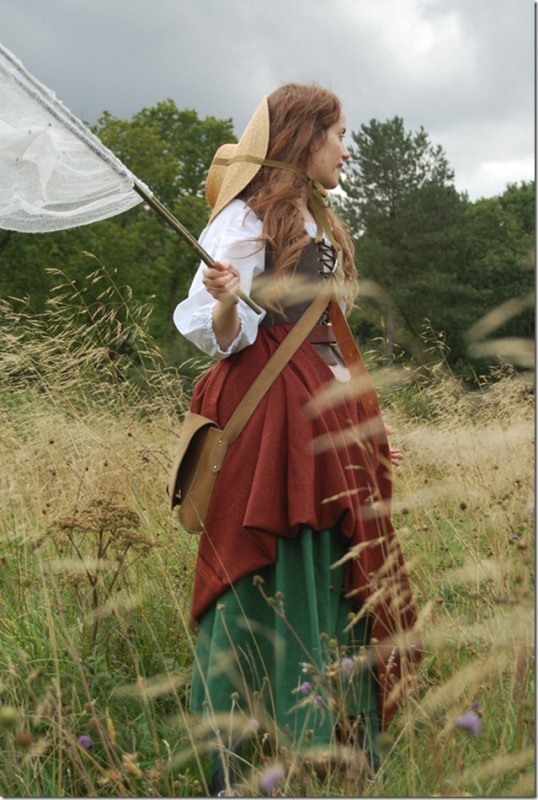 Happily it worked, and to everyone’s surprise, especially Tiffany Haynes (the actress playing Eleanor), the first thing that she did was to capture and safely release a butterfly! The Glanville Fritillary was initially known as the Lincolnshire Fritillary as that was where Eleanor first captured it in the 1690’s. Now, in the UK, the Glanville Fritillary is principally restricted to southern half of the Isle of Wight and on the Channel Islands.